Mecca has the ancestral enchantment of being Muhammad’s birthplace, reason why thousands of pilgrims arrive in it every year to admire it, honour it and venerate it. If the destination of your next journey is this emblematic city, we will get in charged that you get the best accommodation. Next we tell you about the 5 Best Mecca Hotels. Finding the best accommodation to spend your stay comfortably and receiving the best attention is what you will get studying the proposal that each of the 5 Best Mecca Hotels has for you. Makkah Clock Royal Tower: the holy city gets impregnated with luxury with this gorgeous hotel located next to Majid al-Haram mosque. Its 76 floors have made it one of the tallest hotels in the world and it has a 40 metre-tall clock as part of its construction, which can be seen 17 kilometres away. Having access to the mosque from this five-star hotel is very simple thanks to its 76 last generation elevators. When time for meals arrive, nine different places are available either for crowded as for more intimate gatherings. Swissotel Makkah: this modern five-star hotel was the first one in being built in Saud Arabia. 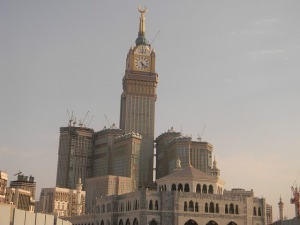 Its views include Majid al-Haram mosque, from which it is near, as well as Kaaba. Its 1.487 luxurious rooms and suites complement the hospitable characteristic Arabian treatment. Among its facilities, the hotel has 2 restaurants, a business room and a business centre. Makkah Hilton Towers: only steps from Majid al-Haram mosque, this five-star counts with an unforgettable view. The arcade in it business centre includes 450 places to eat out and a food court. The hotel itself offers two dining options, accompanied by the most delicious and traditional to crown the typical dishes of the region, prepared by expert hands dedicated to provide their customers all the flavour by which they stick out from the rest of the world. Dar Al Tawhid Intercontinental Makkah: located in front of Majid al-Haram mosque, this five-star hotel offers spacious and luxurious accommodation with views to the mentioned mosque. The style of the room is characterized for having a big amount of ornaments which style reflects the geographical area in which it is. Of course that this one, one of the 5 Best Mecca Hotels does not lack of technology since its rooms are equiped with flat screens with connection to satellite channels and Wi-Fi conection as well. Regarding the food, it reflects Middle East typical dishes, as well as international dishes. Pullman ZamZam Makkah: finally, to finish with the description of the 5 Best Mecca Hotels, here it is this five-star jewel located in the amazing Abraj al Bait resort and by Majid al-Haram mosque. Its 1315 rooms and suites are equiped with elegant facilities, to which is has to be added two unsurpassable dining options and the most luxurious five-star services, while a spectacular view of the Kaaba can be appreciated.